That hard work pays off. Today, AMDA offers one of the finest stage combat training programs for college students in the country. Where most performing arts institutions offer one or two stage combat instructors, AMDA boasts a faculty of 13 instructors between campuses, all of whom have professional combat experience. 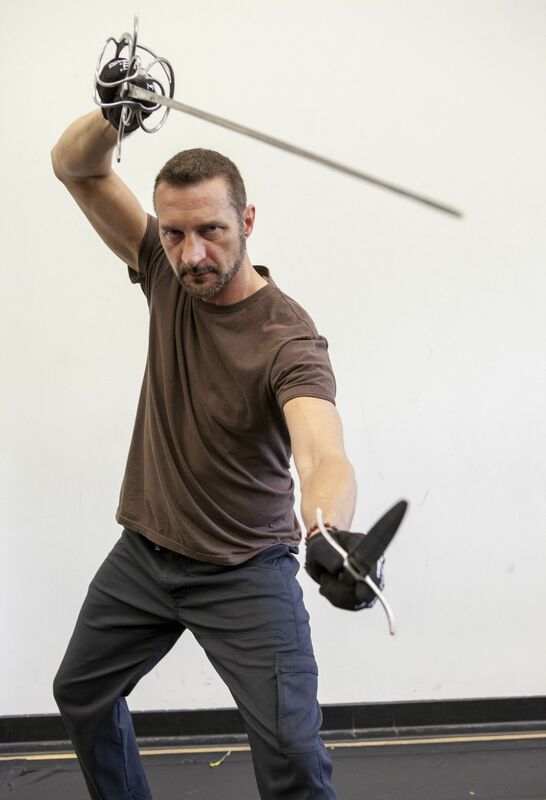 Each spring, AMDA’s students have the opportunity to get certified by the Society of American Fight Directors (SAFD) through a rigorous examination in hand-to-hand combat and rapier/dagger, with some students even receiving recommendations from the SAFD for the seamless integration of combat into their acting. 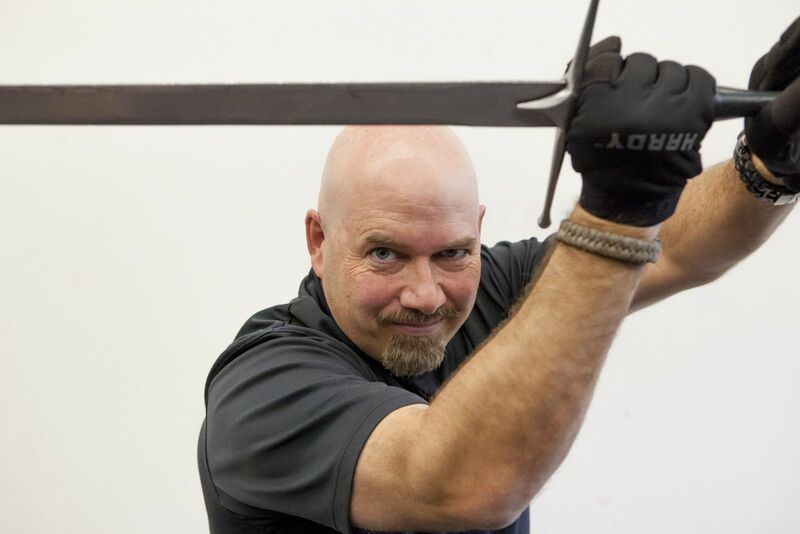 Lacy Altwine, the supervisor for AMDA Los Angeles’ combat division, described a few course options AMDA’s students have: “Stage Combat I is unarmed combat, and Stage Combat II is single rapier combat. ... If they decide to take Stage Combat III, they get to take rapier/dagger and broadsword. After Stage Combat III, we offer three advanced combat classes on a rotating basis: Currently in the fall we offer Fight Choreography/Direction; in the spring we offer the Skills Proficiency Test in unarmed [combat] and rapier/dagger; and in the summer we offer Environmental Combat.” The combat division is also thinking about creating a rotating specialty course, where students can train in specific fighting styles, including martial arts, knight warfare and katanas. Wielding a weapon, however, is only the beginning. The career of a stuntman can involve severe injury and, at times, death. In its stage combat program, AMDA thus takes great care to train its students on working safely in Hollywood’s most dangerous profession. Yet nowadays, safety seems to be the last thing on the audience’s mind: From superhero movies to high-octane car chases, the demand for big-budget violence is greater than ever. As Brown notes, "The audience is faster, more sophisticated in terms of that stuff. So you have to work a little more to make sure you’re delivering that story in a way that they’re gonna buy into.” And therein lies the rub for actors: meeting the extraordinary demands of an audience inundated with Hollywood’s superhuman gods and explosive warfare." It’s a little trickier to create believable works onstage,” Altwine added. “[Movies] can use the camera and camera tricks to make things look great, but you actually have to be pretty skilled to make it look good—really good—onstage. I think that’s where a lot of our students have an advantage, because they get that opportunity to learn that.” For this reason, AMDA focuses its stage combat training on evoking honesty and believability in its students. “It’s not just about the 100-foot wall of fire,” Currier remarks. “It’s about decisions being made—well or badly—by an individual character.” AMDA’s stage combat instructors emphasize to their students that choreography is “physical dialogue” to be taken no less seriously than the spoken line. Successful action scripts share another secret for connecting to their audiences: environments with limited technology. From “Game of Thrones” and “The Walking Dead” to pretty much any blockbuster based on a young adult fantasy novel, Hollywood seems obsessed with pulling audiences into medieval or post-apocalyptic worlds. So why the trend? While the violence may be staged, the fear is real, and that excitement keeps audiences coming. “It offers escapism in a sense, a sense of fantasy that they can escape through another world and live through the characters,” Altwine argues. Bearing this in mind, AMDA’s instructors caution students that great actors don’t turn to the latest fire-throwing superhero for inspiration: To find the real heroes, actors must turn to the world around them. At the end of the day, stage combat is not about flashing swords, exploding motorcycles or walls of fire. It’s an emotional challenge demanding actors to externalize their personal struggles into universal emotions for audiences to understand. AMDA’s stage combat program allows students to tell that story: Surrounded by the clash of ringing broadswords and lunging bodies, AMDA’s instructors push students through a rigorous program that trains students to confront their own emotions, bodies and fears.